RZT-S Zero Cub Cadet lawn tractors are the world’s only electric zero-turn rider with steering wheel control and four-wheel steering. (BPT) - The cars of today aren’t quite your father’s car. While that’s not a surprise given the rise in new technology for the automotive sector, what some homeowners may find surprising is the level of technology with items in the garage next to the car - like the lawn equipment. Here are three unique ways today’s lawn equipment is featuring automotive-like technology. While Bluetooth technology has become more of a standard on new cars, it is actually a unique feature on lawn equipment. With the Cub Connect mobile app, owners can connect their smartphone with certain lawn mowers, garden tractors and zero turn riders via Bluetooth. 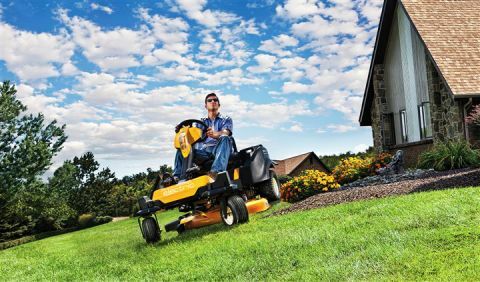 It takes the guesswork out of maintenance by allowing the lawn tractor to alert its owner about needed oil changes, blade maintenance, air filter replacements and other routine maintenance. “With so many apps available for things homeowners don’t use, this app can actually help them keep track of maintenance for an important piece of equipment,” says Jason Cameron, home expert and TV host. Electronic Fuel-Injected Engines - or EFI engines - were popularized in the automotive sector in 1980s. However, no one had been able to engineer the same type of technology in residential lawn tractors until this year. For the first time ever, fuel-injected engines are now available on XT2 LX42 Cub Cadet lawn tractors. The new engine technology reduces emissions and delivers excellent fuel consumption - using up to 25 percent less fuel than carbureted engines that are standard on other lawn tractors. Another advantage of the engine technology is that riding mowers with these engines feature a one-step start, making it easier to start in all weather conditions. The push-button start mirrors the features in many cars. Hybrid and electric cars have carved a place in the automotive world, but there is now an equivalent to that eco-friendly technology for lawn care. The RZT-S Zero is the world’s only electric zero-turn rider with steering wheel control and four-wheel steering. It requires zero gasoline, zero oil, zero oil filters and provides zero emissions and zero engine noise, making it one of the most environmentally friendly lawn mowers on the market today. It operates on battery power, which provides up to 60 minutes of continuous mowing on an overnight charge. For handheld lawn equipment, there’s a new technology available that also provides zero emissions. Cub Cadet powered by CORE uses a sophisticated motor technology to deliver more torque with longer runtimes and no gasoline. It’s the same type of technology used in wind turbines and even submarines. In addition to providing zero emissions, it offers reduced noise and high torque levels equal to two-cycle engines most common in garages. This technology is available in string trimmer, hedger and leaf blower options. With features like Bluetooth, push-button starting, fuel-injected engines and zero emissions, cars aren’t the only products showcasing innovation. The next generation of lawn equipment is designed to help homeowners create their ideal outdoor spaces by incorporating efficient new technology. More information about these automotive-like features is available at www.CubCadet.com.